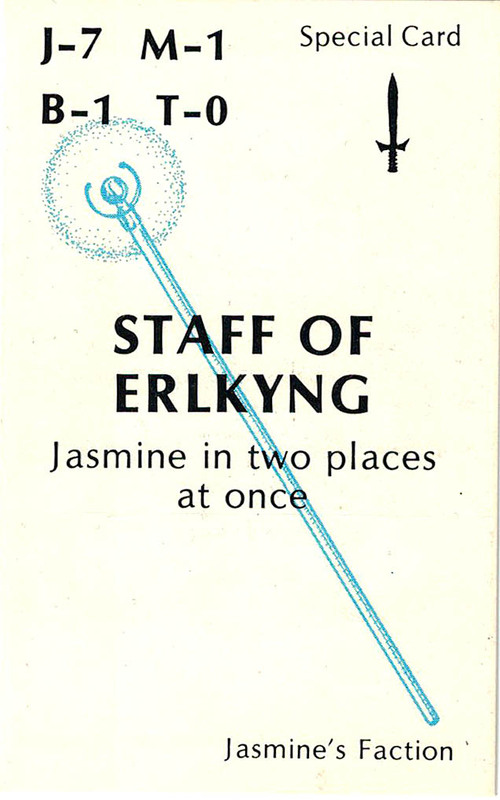 ‘Staff of Erlkyng” Special Card in “Jasmine: The Battle for the Mid-Realm” Collector Card Game. After the coming of the Third Age, the forces of Evil consolidated their strength. The Guardians of Wisdom (and Chroniclers of History) had long seen the change coming. But they waited patiently for the fates to send a savior to the Mid-Realm. At the appointed hour, their knowledge could not prepare them for the shock that the revealed chosen one was a frail-looking maiden who, until then, had never ventured far from her father’s castle. The fate of the Mid-Realm looked bleak indeed. Still, they prepared her for her journey. From the sacred jasmine plant, the harbinger of her coming, they fashioned her clothing. So she would never fatigue, they made sandals from the stems of the plant. That she would never suffer from the extremes of heat or cold, they created a cloak from the leaves of the plant. and that she would always find the courage to grow and discover her own nature, they fashioned a gown from the delicate white jasmine petals. Only when the ancient staff of Erlkyng would be presented to her by the spirit of its predecessor did the maiden finally begin to understand. Taking the staff, her strength surged through the length of it. After two ages, the Mid-Realm witnessed the light of hope. In that moment JASMINE was born. And so it came to be that the meek inherited a mighty undertaking. This entry was posted in Jasmine & Role Playing Games and tagged Battle for the Mid-Realm card game, Guardians of Wisdom, Jasmine, staff of Erlkyng, The Story of Jasmine on February 6, 2018 by Darlene. Have the original Jasmine strips been reprinted anywhere? God bless” and “Dear Jasmine all of the stuff you have done within our lives will stay there forever until we pass by. ” Another referred to the smiling school girl as a ‘shining star’: “To Jasmine you are now the brightest shining star in the sky.